Gus G. commented on the recent activities in the Firewind camp as follows: "Hey everybody! Hope you've all had a great summer. We sure had a blast out there and we've just finished our festival run in Europe by playing an amazing gig at Germany's Summer Breeze Open Air. We recently decided to film some special videos for our YouTube channel, FireTV, to keep you updated about what goes on backstage and while we are traveling. Here's the first one from our recent visit to the UK for Bloodstock festival. There's more to follow, so stay tuned! Finally, we're looking forward to playing Australia for the first time ever in the band's history! So get those tickets now 'cause Greece's finest will be making its way Down Under!" 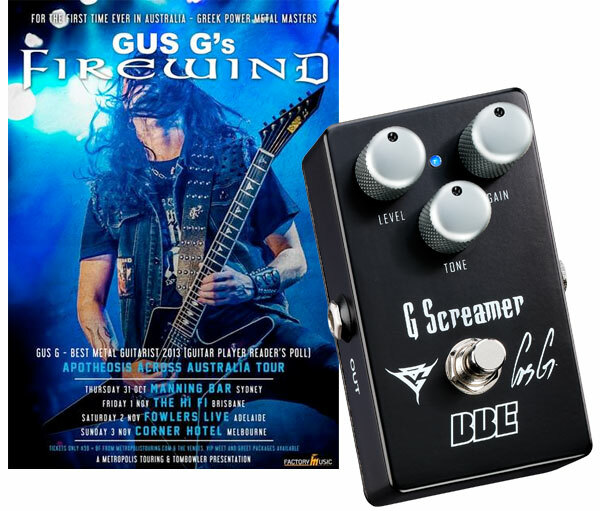 About the BBE G Screamer™ Gus G Signature Overdrive: The music of Gus G and his band Firewind can be described as melodic, soaring and punishing - in short, metal masterpieces. But just as Gus is shaping the bleeding edge of metal, he is deeply passionate about its roots, as evidenced by his scoring the coveted gig as guitarist for Ozzy Osbourne. Gus' gear reflects his passion, inspired by the classics and updated for a new level of sophistication and musical expression. BBE stompboxes share his ethos, born out of respect and appreciation for the classics while pushing forward, evolving the breed. Gus' new G Screamer signature overdrive is a thundering example. For years, the BBE Green Screamer was Gus' overdrive pedal of choice. But working closely with BBE's legendary mastermind Paul Gagon, Gus has now dialed in his tone still more, for solos that power his vision for the modern metal realm. More information here.